Another weekend, another superhero feature film that I'm not going to see. This week's offering is X-Men: Apocalypse. I've been looking for a reason to take another look at (and discuss) this issue, and I guess this is as good a time as any. This issue is special to many, myself included, as it shows the first ever meeting between the two "it" teams of the 1980's comic book landscape. Chris Claremont, along with such talents as Dave Cockrum, John Byrne, Paul Smith, and John Romita Jr. made the X-Men the straw that stirred the drink at Marvel for the better part of a decade. Over at DC, Marv Wolfman and George Perez reimagined the Teen Titans, bringing them into the 1980's from their more silver-age roots. Both of these books managed to capture my imagination, and I would bet I'm not alone in that. Let's take a look at these two phenomenal teams as they face off with the combined threat of Dark Phoenix and Dark... seid (with a dollop of Deathstroke, to boot). We open at the Source Wall. Darkseid and Metron are sharing a less-than-pleasant exchange, with the latter about to embark on an attempted trek to the "other side". It's made pretty clear that Darkseid cares not for the safety of Metron, and is only using him as a means to an end. Meanwhile outside of Salem Center, Professor X is overseeing an X-Men training exercise in the Danger Room. Wolverine, Colossus, and Nightcrawler are doing their best to outmaneuver some heat-seeking missiles. We also meet Kitty Pryde, Cyclops, and (current team leader) Storm who are going about their daily routines. That night, after a delicious Kitty-prepared meal, the X-Folk retire for the night. As they slumber, they are all touched... induced to dream about their fallen teammate Jean Grey, more specifically Jean in her Dark Phoenix form (considering when this was written, we'll just play along for now as though Jean ever really was Dark Phoenix). Kitty awakens during the touch, and finds the grinning face of Darkseid greeting her. She lets out a scream that would do Banshee proud, and wakes up the entire mansion. As Scott wanders across the house, he is approached by a screaming Jeannie... which gives him quite the pause. In New York City proper, Teen Titan Raven is dreaming. She is in her soulself form, soaring through the nothingness of the dreamscape. She is suddenly engulfed in the flaming wings of the Phoenix. She, like Kitty, wakes up screaming. This draws Starfire to her side. The two are approached by Changeling, who attempts to make light of the situation by transforming into a Phoenix-like bird himself. This causes Starfire to lose her cool, and sock him/it in the face. She apologizes, and claims she was frightened by the vision of the Phoenix. We will later find out that she is all too aware of the legend. She sounds the Titans Red Alert to call in the troops. ... who is currently at S.T.A.R. Labs in Gotham City. He is foiling a robbery, and is surprised to find that the would-be thief is in fact a Parademon. He's even more surprised to find that the Parademon is taking his orders from Deathstroke the Terminator. Slade makes quick work of the Boy Wonder, and leaves him laying. We rejoin the X-Men, who are at Jean Grey's parents' house in Annandale. The Greys make mention of strange dreams they had of their daughter that same night. Before the team can dig too deeply, they are interrupted by the astral projection of Professor X. He brings to their attention several key locations that had mysterious incidents occur at the same time Jean popped into all of their heads. The Titans find Robin kayoed in an alley. They reconnoiter and share the stories of the night. 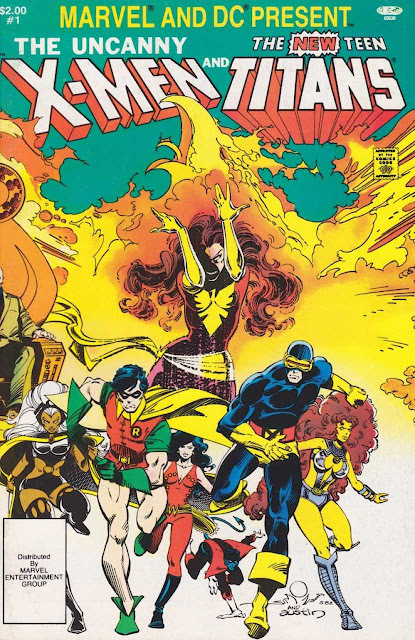 Starfire reveals that prior to her joining the Teen Titans, she had known of the Phoenix. She also mentions by name the Shi'ar and their Majestrix Lilandra. The team comes to the realization that someone called Phoenix was once affiliated with the Uncanny X-Men, and decide they'd be their best bet at getting to the bottom of all this. Elsewhere, Deathstroke the Terminator is overlooking the manufacture of a gigantic Kirbytech machine. He is attacked from behind by a (lead?) Parademon called Ravok the Ravager. We now learn that Slade is working on Darkseid's behalf, and following a bit of a back and forth Ravok is sent out to abduct the X-Men. At the X-Mansion, Professor Xavier sleeps alone. The silence is soon broken by Starfire crashing through the wall with designs (for whatever reason) on fighting the X-Men. Professor X easily drops her with a Psi-Blast, he is, however, taken by surprise by Raven and the rest of the Titans. Raven manages to knock the Professor out, and the team questions whether or not they were right to break in fists-first. Before they can decide, a cadre of Shock Commandos break in and start blasting away. The Commandos have an easy time (perhaps a bit too easy) taking down the Titans. They mistake this team of heroes for the X-Men, and abduct them for Ravok... all except Changeling, that is. He shape-shifts into a Parademonic form and hops into the Boom Tube before it closes. The next morning, the X-Men find themselves at a New Mexico butte. This is the last place Scott Summers and Jean Grey had true happiness... the caption says "consummated their love". This is the location that Deathstroke's magical mystery machine is being constructed. It resembles a pregnant rocket ship. The X-Men manage to get the jump on Slade and Associates, and a battle rages. We are teased (really, really teased) with the possibility of a Wolverine/Deathstroke one-on-one fight, but the others get in the way. Cyclops optic blasts a cluster of demons, and Colossus tears down the machinery. Deathstroke unholsters his handy-dandy "fear ray" and shoots Storm. This causes a chain reaction that ultimately shifts the tide of battle into Deathstroke's favor. In a desperation move, Colossus charges at the Terminator, only to fall victim to a baaaaaaack body-drop off the butte. Whattamanuever! Slade's stock will clearly be on the rise should he turn the muties over to Darkseid. We observe Ravok's Ravagers deliver the Titans to Darkseid at the Source Wall. Darkseid ain't pleased, and he doesn't care who knows ir. He knows these aren't the X-Men, like he'd requested. Moments later, Slade shows up with the X-Men. Darkseid don't cotton to failure, and as such, blasts Ravok with his Omega Beam. He does so in front of Slade to send a message... oh, and Gar's disguise proves to be as useful as one would imagine. ... and he does just that. The two would-be world destroyers join hands, and Darkseid enlightens his captives of his current ambition. He is planning on turning Earth into New Apokolips, and needs the Dark Phoenix at his side to do so. The two strut into a Boom Tube, and no sooner do they vanish then our heroes become unbound. The Titans and X-Men help each other to their feet, and finally meet (and join forces) in this most awesome page. The X-Titans (I can't take credit for that one...) realize that they only have about an hour worth of breathable air left, and must find a way back into a more stable atmosphere. Cyborg uses his radarscan, and finds an errant object floating nearby. Using Starfire's star-blasts and Cyclops optic-blasts as jet propulsion, they begin trekking the stars. What they find is Metron's Mobius Chair. Kitty and Gar begin to make-nice, and are both lounging on the (assumed useless) chair. Kitty wishes they were home, and they (and the chair) vanishes. They return moments later, and now realize the power of this magical piece of furniture. Kitty has Changeling transform into the shape of her good buddy, Lockheed the Dragon... only on a massive scale. The plan is, he'll sit in the Mobius Chair, and the X-Titans will all climb aboard him. Colossus looks a bit perturbed that Kitty and Gar are getting on so well, and says as much in Russian. Starfire overhears, and plants a big kiss on him. We learn that she learns new languages through touch... and that she has a bit of a flair for the dramatic. Kitty doesn't dig that so much... calling Kory a "hussy". The X-Titans wish themselves to the skies above New York City, and Raven uses her empathic powers to find Darkseid. She knows how to find him by the way he leaves an "empathic void". It would appear that Darkseid is deep under Central Park, where as (bad) luck would have it a half-million people are currently enjoying a Concert in the Park. The team transports themselves underground, into Darkseid's cavernous underworld labyrinth. As the gang attempts to get their bearings (Wolverine and Gar try to catch a scent, Storm deals with her claustrophobia), Deathstroke launches an attack. Suddenly the X-Titans are overcome with Parademons. After a bit of a fruitless battle, Storm "brings down the roof" with a bolt of lightning. Deathstroke looks on, and makes mention of the precision in which Storm acts. She managed to bury all of the Parademons without injuring or killing any. The team enters Darkseid's great hall. There is a large opening where Darkseid and Dark Phoenix are standing. A brief battle ignites, featuring another tease of some Wolvie on Slade action. Dark Phoenix and Raven enter a deeper battle in which Phoenix claims the two share so many commonalities they could be sisters. At Darkseid's order, Phoenix fires a blast into that large opening, causing the "Hellpit" to be born. The purpose of the bolt of Phoenix-Energy is to strike at the Earth's core, and tear the planet apart... making it resemble Apokolips in looks, and features. While Darkseid pontificates and brags, Kitty and Gar work at destroying his machine from within. Professor X (in the frickin' Mobius Chair) approaches Raven. He suggests that the only way the Earth will survive is if they team up on Dark Phoenix. Raven is a bit wishy-washy to the thought, but ultimately comes around. As the X-Titans fight off the Parademon Hordes, Xavier and Raven strike at Dark Phoenix with a blast of... love. Okay, corny... but I'll allow it. The Psi-War begins! We get our third tease at a Deathstroke and Wolverine battle, until Cyclops intervenes with a well-placed (but uninvited, if you ask me) optic blast. Back at the Psi-War, Raven brings attention to the fact that without her power, Dark Phoenix will dis-corporate. She will need to be at full power to survive and remain corporeal. At Robin's suggestion, Dark Phoenix decides to reabsorb the Hellpit-bound Phoenix bolt. Darkseid... ain't pleased. The X-Titans tackle him to the ground, and just as he is about to loose an Omega Blast, Starfire launches a pair of star-bolts into his eyes. Powerless and unable to even watch, Darkseid stands by as Dark Phoenix reabsorbs her energy blast. Once that is complete, the X-Titans seal the Hellpit up tight. Feeling that all is not quite lose, Darkseid tells Dark Phoenix that she can stay corporeal and unleash her energy burst if she takes a new physical form. Cyclops knows he's the man for the job, and orders his teammates to scatter. Dark Phoenix launches herself into her (at the time) former lover... and briefly manages to take over his body. This marks the first time Scott Summers has been overcome by the Phoenix Force... I think these days, it's a monthly occurrence for him. With the power of the Phoenix inside him, Cyclops turns his attention Darkseid-ward, and launches a Phoenix-Powered Optic Blast at the Tyrant God of Apokolips. The Phoenix Force grabs Darkseid in its talons, and flies skyward. The concert-goers above mistake this for an incredible fireworks show, and wildly cheer the event. The fiery bird and her bounty leave orbit and fly directly into the Source Wall. With the day saved, the X-Men and Teen Titans quietly celebrate their victory. We close with Metron in his Mobius Chair floating by the Source Wall, now with the face of Darkseid carved into it. It is said that anyone who tries to pass the wall is doomed to become part of it, so I suppose this is the last we'll ever hear of Darkseid! Man that was a lot of fun! Really makes me wish the big two could tell the movie-makers to take a hike so they can go back to telling fun one-offs like this. That's not likely, of course... maybe when the "straights" decide they're over the whole superhero feature film thang, we can get some more of this ilk. I was really unsure about this when I saw that Marv Wolfman didn't have any involvement with the scripting... 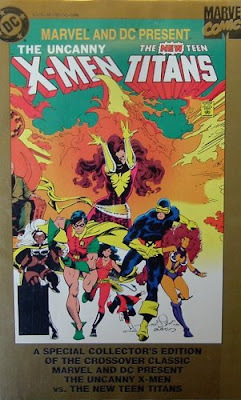 I wondered if Chris Claremont could do justice to the Titans, and boy did he! 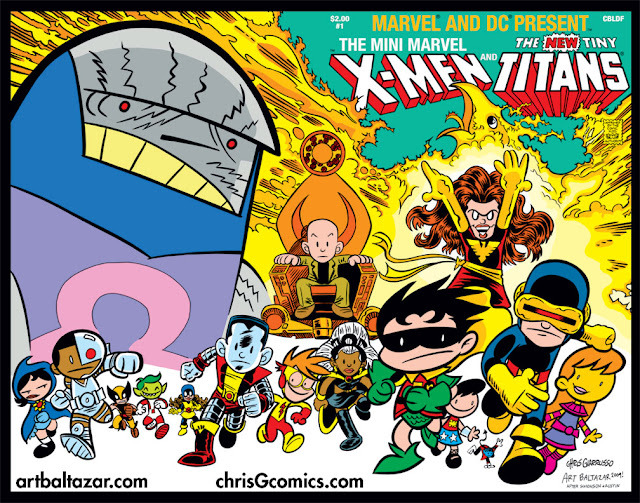 All of the Titans (as well as the X-Men, naturally) were all kept in-character, and did not feel out of place during this tale. The comics of today could learn a thing or three about not bending characters to fit their story, and instead creating stories that bring out the best elements of the characters. Perhaps my only complaint was the way this issue made it seem as though the X-Men and Titans inhabited the same Earth... literally the same State... with only about forty miles separating their respective headquarters. That, I will admit seemed a bit off. Seeing Robin mention the Justice League and the Avengers in the same breath was strange as well. Given the opening of the story, I just assumed that the Source Wall would be breached, with the Marvel Universe on one side, and DC on the other. Back to the characters... the scenes between Kitty and Gar were absolutely adorable. Seeing them instantly click, and sorta having some potentially romantic chemistry was a hoot. The jealousy that arose from Kitty and Piotr was also neat. It was a riot when Starfire threw herself onto Colossus's... mouth to learn Russian, and Nightcrawler was all "Hey, you wanna learn German too?" Man, these characters just worked so well together. I do wish more time was given to Wolverine though. I'd have loved it if there were a 3-5 page extended fight scene between he and Deathstroke. That would have been amazing. I guess I oughta be happy we got as much interaction between Logan and Slade as we did though. I was happy that the classic Marvel "misunderstanding battle" that occurs when heroes meet for the first time was (mostly) sidestepped here. The Titans did have a misunderstanding... and did attempt to attack the X-Men, but circumstances kinda got in the way... and we were spared the fight. As with the 1976 Superman vs. the Amazing Spider-Man one-shot, this is definitely worth tracking down... even for its novelty value alone! The fact that this is an awesome story, with incredible art is a bonus! This one has only been reprinted once by its lonesome during the mid-nineties bubble-burst-a-palooza. 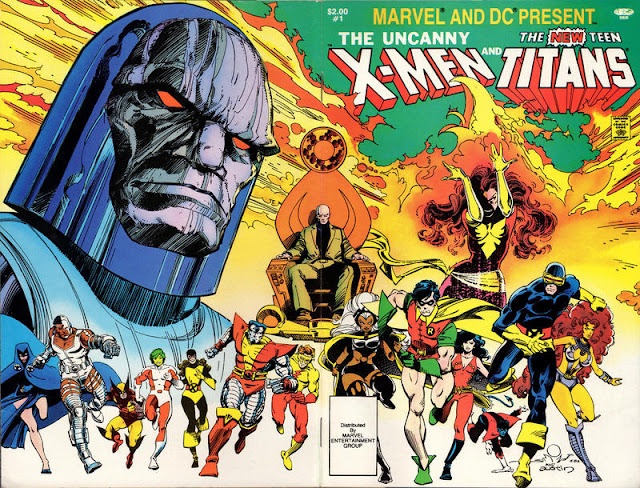 EDIT: It was brought to my attention by joecab that the Marvel/DC crossovers were reprinted in collected edition in Crossover Classics, Volume 1 (released in 1991 and 1999). That's something I really should've known! This bugger is out-of-print, and demands quite a bundle online... but it comes with this issue, Superman vs. the Amazing Spider-Man, and a Batman/Hulk crossover! If you're headed to the theater tonight/this weekend to see X-Men: Apocalypse, I hope you enjoy the film! Before you go, get your undergrad-in-Apocalypse by checking out this great piece by good buddy Mike Carlyle! Great write up! It captured the same excitement I had when I laid my hands on this baby. One little correction: that wasn't the only time this comic was reprinted. All four of the Marvel/DC comics were collected in one TPB volume, Crossover Classics, in 1991 (reissued in 1999). Hello Joe! Thank you for stopping by. Ya know... I *really* should've known that! I've actually SEEN that book! Don't know how I forgot about it. I went ahead and updated the post, and credited you with the correction. My pleasure. I would have forgotten myself if I didn't locate it during a recent reorganization. Yeah, it totally blew me away when I saw the price on Amazon. I certainly wasn't expecting that! I wish Marvel and DC would get their crap together and get these crossovers back in print...There was a listing for a Marvel/DC Omnibus a few years back, complete with a John Romita, Jr. cover, but the powers-that-be must not have been able to come to terms. Shame, because I'd buy it in a heartbeat. Anyway, this was one of my go-to books to reread when I was a kid.....I must have read this issue a few hundred times. And,yes, my staples did come loose and fall out. It's really too bad that the comics are just there to support the movie IPs anymore. I'd love to see that omnibus pop into print, but, couldn't imagine it happening in the current landscape (hopefully I'm wrong). I keep thinking there's so much potential in these crossovers. Hahaha, I actually hadn't noticed that... now I won't be able to NOT notice it!